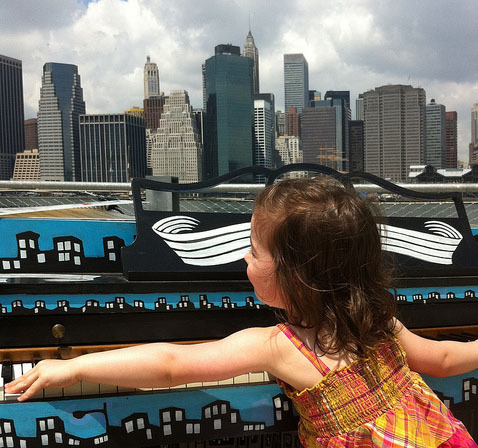 In its second year, 88 pianos ‘popped up’ this summer around NYC prompting spontaneous stages, concerts and engagements from people of all ages and walks of life. Sing for Hope, a non-profit organization, whose mission is for all New Yorkers to have access to the arts, raises money to purchase the pianos year-round which are then ‘finished’ by different volunteer artists, scattered in public around NYC for two weeks, and finally donated to local schools, hospitals and community facilities. The ‘pop-up’ event is supplemented with online communications and competitions for ‘Best Music Video’ and ‘Photo of the Day’. There are scheduled performances throughout the two weeks by volunteer artists (e.g. Broadway stars, local songwriters, and ballerinas) that gather large crowds. For two weeks public space (many underused) around the city is activated (adapted) with these pianos, creating an activity, a buzz, that would otherwise not exist bringing people together and giving life to the city.